When my circumstances changed two years ago I dreaded finding a suitable dog walker for my then two dogs. I wondered whether I could afford the walks needed during the day while I was at work but most of all, who could I trust them with? There are far too many people set up as dog walkers these days but have no real experience of dogs other than their own pet. After scouring the usual notice boards in the village shop, post office and local papers Mandy came recommended from a lady who I'd see out when walking the dogs myself. She too used Mandy when she was at work. From the moment that Mandy and her husband came to the house to meet me and my two I felt confident that she would be able to handle two strong willed personalities. Mandy is highly reliable and turns up come rain or shine. She will structure her groups for each walk dependant on their individual temperaments and needs. The walk will often last longer than an hour and in bad weather she will wipe paws before depositing them back in the house. I can't recommend Mandy highly enough. I completely trust her with my now one dog and it all comes at an affordable price. And the best recommendation comes from my own dog, who when I am working from home and Mandy comes to collect her she trots off happily without a back glance at me! Mandy is more than just a walker for my dogs, to my dogs she is their second mum, they both clearly adore her. Having Mandy has meant that I can go to work safe in the knowledge that Mandy will collect them, take them for a walk and bring them back happy, content and exhausted. Dog Walking Care Services have been regularly walking our Westie for a number of years. They are such fantastic people and he just adores them. Mandy and Tony are reliable, trustworthy people who have a real passion for the health and wellbeing of the animals in their care. Our boy loves playing with his pals and having fun on the varied walks he is taken on. He likes to find lots of muddy puddles but is always cleaned up before his return. Our son has been admitted to hospital on a couple of occasions but with one quick call to Mandy, our beloved pooch has been picked up and taken care of. I would not hesitate to recommend their services. Mandy has been looking after Hugo, our 8 month old Retriezsla for 3 months now. She is efficient, prompt and Hugo is always itching to be walked! Hugo has come on leaps and bounds in the time he has spent with Mandy and she is always flexible with dates and times when we are in need. He walks well on the lead and his recall has certainly improved and much of this is thanks to Mandy and her care! We could not have found a better dog walker! Mandy had been looking after both our dogs since they were puppies, first doing puppy visits and then for ad hoc walks as required by our work commitments. She can always be relied on to help when needed and we wouldn't hesitate to recommend her to any one else. Our dogs, Tilly and Tess, tell us they love their walks with her and their doggy friends. Digby always has a lovely time when he goes to Tony and Mandy's. He is treated as one of the family, meets lots of new friends and gets long woodland walks. We can relax knowing that Digby is safe and cared for by people who really know and understand dogs. Thank you. We are first time dog owners. Tony and Mandy have been so supportive, helping us with puppy training, advising on illnesses, and all aspects of caring for our new puppy. 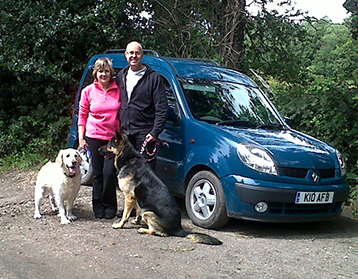 Tony and Mandy have looked after Phoebe for almost two years. They are excellent. Phoebe is very happy with Tony & Mandy. Spending time with Tony and Mandy has improved Phoebe's discipline and really helped her to socialise with other dogs. I have recommended Tony and Mandy to other families, all of us are delighted to have reliable, caring and home based care for our pet. Mandy has walked Merlin (our Samoyed) for a year; she is simply wonderful. She truly understands dogs and helps train the owners too! Merlin adores her and we trust Mandy 100%. Furthermore, she is very flexible, often responding to last minute requests for additional walks or weekend stays. I would have no hesitation in recommending her to anyone in need of a reliable and caring dog walker. Gold star!! I am Merlin's Grandma, when I visit Arborfield to look after my Grandaughters, my Daughter still arranges for Mandy to take Merlin for his walk. He can't wait to get in her car, he is so pleased to see her. On the return he is quite reluctant to get out of the car. There is more to being a dog walker than merely walking a dog. Mandy is very knowledgeable, ask her any question on health or handling and she has the answer. Mandy is a lovely friendly person. In the time I have known her she has proved completely trustworthy, is very well organised and punctual, and so obliging and helpful when the odd emergency hits. But best of all Merlin loves her. What more do you need? Mandy and Tony are the only people that I trust with my very precious dog, their care gives me the ability to be able to go to work or on holiday and not worry about leaving my dog alone or in kennels which is very important to me. They have excellent dog handling skills which is neccessary with my very large and sometimes willful dog, but they also give him all the love and attention that I think is necessary. Midnight has a fantastic time with all his doggy friends and they are very mindful of his medical problems and have always provided the care that is best for him. Long may they continue because I would be lost without them. Each morning at 9.30, Max my Staffordshire Bull Terrier takes up position in the hall to wait for Mandy and Tony. When the car pulls into the drive around two hours later he goes mad with excitement. He jumps into the back, sniffs and licks all the other dogs and goes off for his walk. But it hasn't always been this way. Max was a rescue dog who had been badly beaten by his previous owner. He spent a lot of time segregated from the other dogs but Mandy and Tony slowly introduced him to the pack. Now his behavior has come on leaps and bounds and all the other dogs are considered his mates. Max adores Mandy and Tony, listens to commands and likes to think he's King Pin. 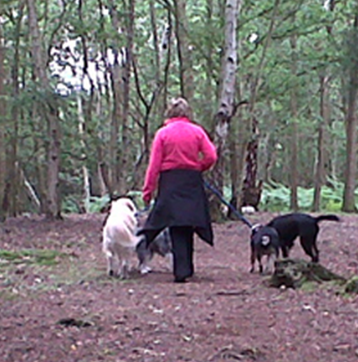 Dog Walking Care Services is a very personalised service to fit the dog's needs. Max also goes for sleepovers and comes back shattered. It's his second home and there is no where else I would want him to go. The consistency of the service and the people fill me with confidence that when I go on holiday Max has a great time too. I would highly recommend Dog Walking Care Services. Mandy and Tony are Max's extended family and they treat him as though he is their own dog. I have been using Dog Walking Care Services for over 2 years for my two lively Springer Spaniels and the service has been exceptional. Both Mandy and Tony really care for my two like they're their own and I trust them implicitly with their safety. I would not hesitate to recommend their services to anyone!!! For over 2 years now, Mandy has looked after my dog on a very regular basis. Mandy first looked after him when he was a puppy of 14 weeks on day care, then he has stayed at her home for periods of up to 2 weeks, Mandy has a fabulous bond with him and he responds to her so well and now she walks him Monday to Friday. My job and commitments have changed considerably in the past 2 years and Mandy has been hugely flexible, reliable and adaptable. I trust her implicitly with my dog and also in my home. Mandy has a fabulous bond with Duc and has helped shape him into the happy well behaved dog that he is. I also know that her family also take wonderful care of Duc when he is at their home. Knowing that Mandy looks after Duc so well is just such a luxury. I would just like to say how much I appreciate the dog walking care service you offer. You are accommodating, reliable and take great care with my 4 year old Ziggy. I am impressed with the way you have taken time & care to understand Ziggy to ensure he gets the most out of each walk over the past year. There is absolutely no doubt that he is overjoyed to see you each time & comes back a happy, tired dog. I hope that you will be able to offer this wonderful service for many years to come.